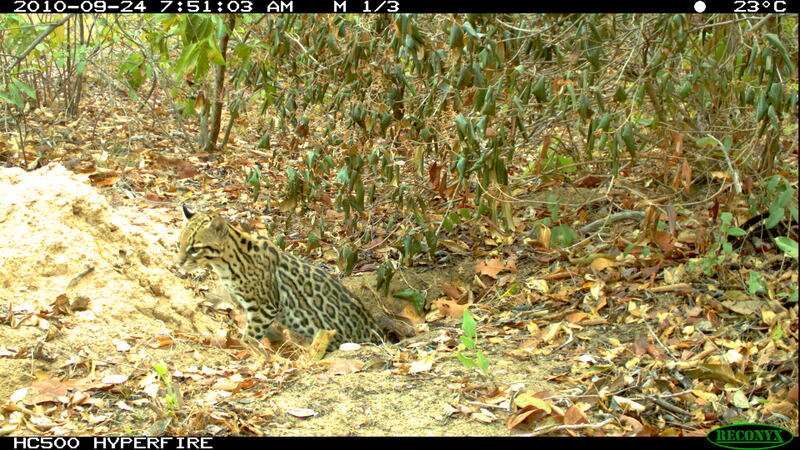 Ocelot hanging out in the burrow of a giant armadillo (Priodontes maximus). There’s a great Insights paper by Arnaud Léonard Jean Desbiez and Danilo Kluyber in the September 2013 issue about the important role Giant Armadillos (Priodontes maximus) play as ecosystem engineers as Brazil’s Pantanal. One of the things that caught my eye is that the burrows are used by as many as 24 other vertebrate species. They include some amazing camera trap photos in the Supporting Information, like the one of the Ocelot above, that would be great for teaching and lectures. If you don’t have access to the article please email the corresponding author and he will send you a pdf. UPDATE: The BBC has posted pictures from this article on their web page and they are awesome (31 October 2013). UPDATE 2: A nice long interview and article summarizing the work, with tons of pictures, on Mongabay.com (5 December 2013). UPDATE 3: Frontiers in Ecology and the Environment has also done a nice story on the paper. Link here, though for some of you it may be behind a paywall (5 December 2013).